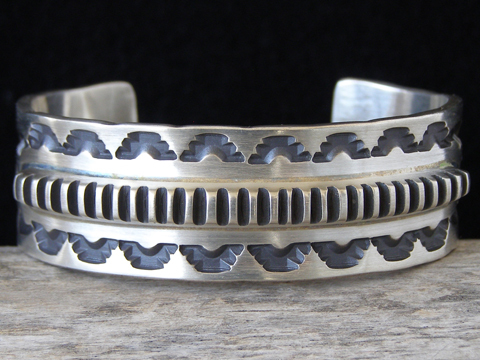 Jerald Tahe Deep-Stamped Sterling Bracelet size 6 5/8"
This bracelet is made with sturdy 12 gauge Sterling and decorated with extremely deep stampwork that encircles the entire cuff from terminal to terminal. In addition, he added an appliquée band of 12 gauge Sterling marking the equatorial center of the cuff in front. He used a cold chisel to mark this ribbon of Sterling with vertical grooves. It's a very nice textural feature.